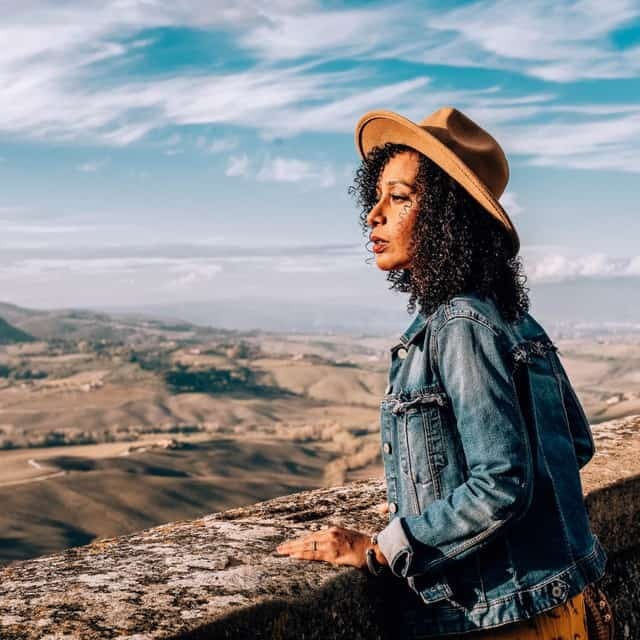 If you find yourself in Florence for a day rest assured that there is plenty of time for all the things to do in Florence. 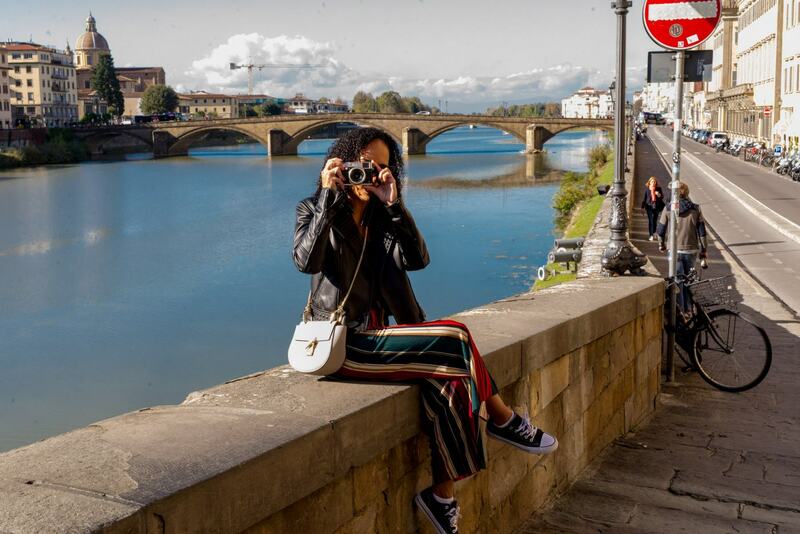 After landing in Florence airport and before heading to our wine adventures in Tuscany we decided to spend a day in Florence. 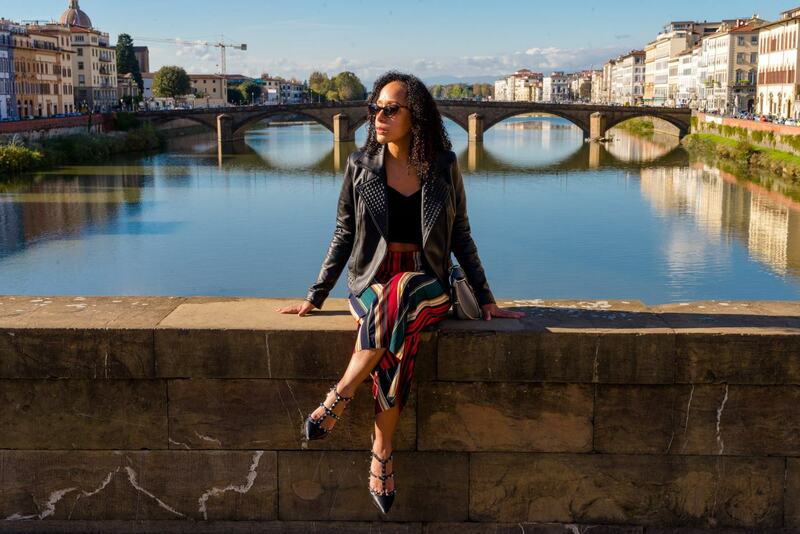 After doing a lot of research and seeing things for myself I wanted to share this guide for those that have a layover or just a day in Florence. You can definitely see everything with a little bit of planning. 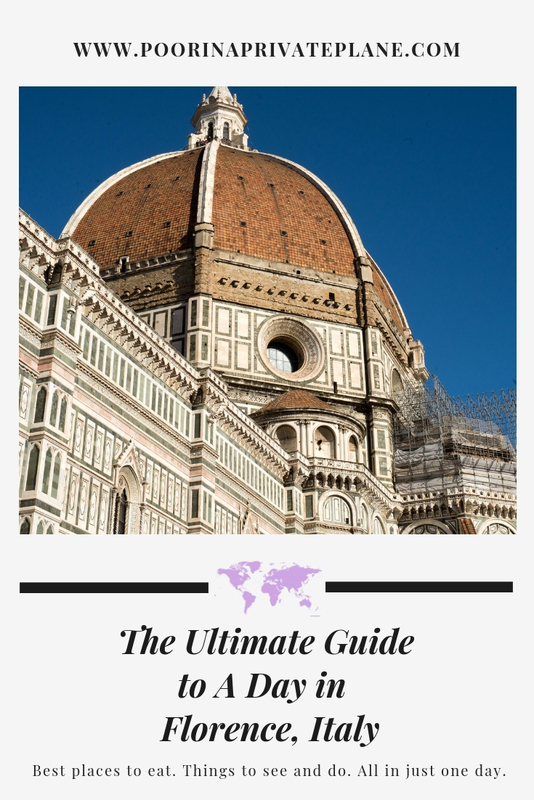 With a little help from my favorite travel guide from Rick Steves, we managed to put together an itinerary which gave us the opportunity to see everything that Florence has to offer. While it is not advised to drive in Florence if you are like us and have a car there are a few options for parking however keep in mind most of the options are just outside of the city and may require a 10-20 minute walk minimum. The historic center of Florence is a ZTL zone which means you are not allowed to drive in this area without a permit. This is very important. Make a wrong turn and you will immediately be hit with a high fine. It is not worth it. It is best to stay well outside of the city and opt for an option away from the ZTL. Located right on the A1 the best and cheapest option for parking if you are looking to spend a day in Florence is Villa Constaza. Located a short tram ride from the city parking is only 7 Euro for the entire day. From there you can take the T1 which is a easy ride in and out of the city. This was the option that we chose and it really gave us a peace of mind to know that we weren’t risking mistakenly driving into the ztl. This parking lot is just out the ZTL zone located in Piazza Della Libertà. 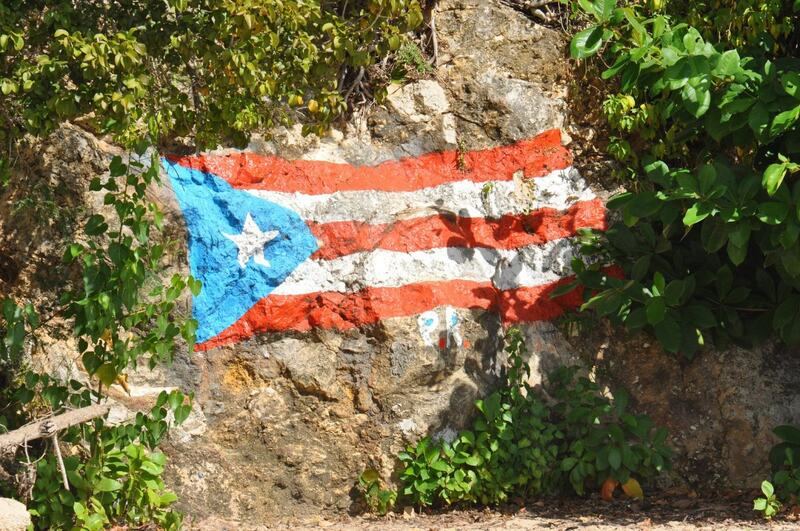 It is about a 20 minute walk to the city center. Rates start at 2 Euro an hour or 10 Euro for the day. Just be very careful not to inadvertently enter the ZTL. People used to park for free at Piazzelle Michelangelo. This is no longer the case. There are still a few spots however they are all paid spots and cost 2 Euro an hour which can add up. We arrived in Florence around noon and we were still able to see and do everything we wanted to see in about 7 hours times. 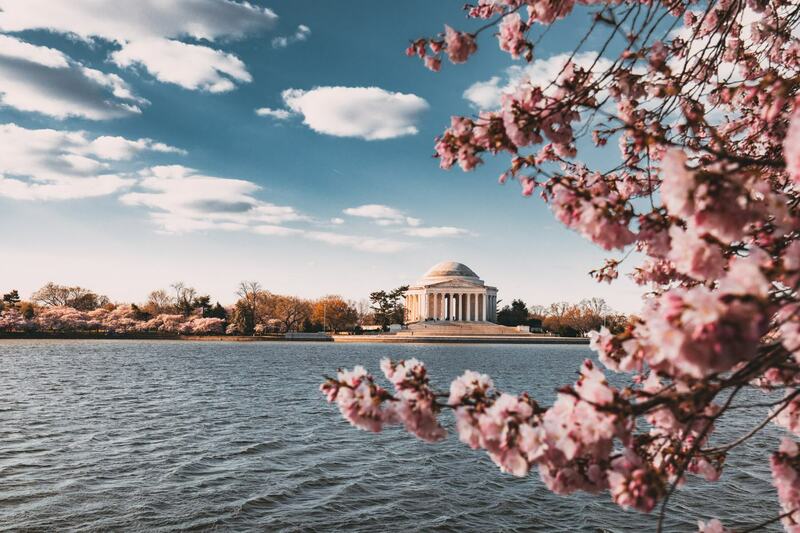 I am sharing how we chose to spend our day however feel free to make this itinerary your own depending on the time of day you arrive and how much time you spend at each of the sights. The whole goal is give you the guidance you need to come up with your own perfect day in Florence. 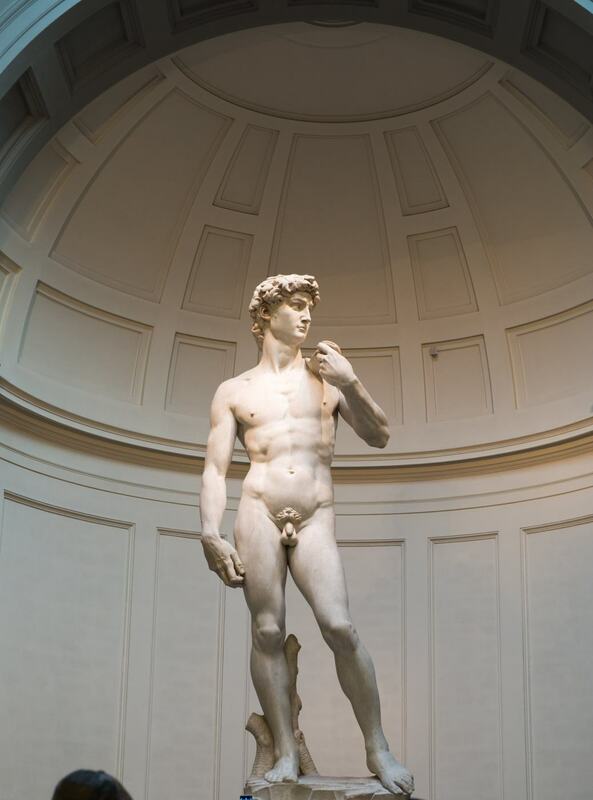 Most people come to Florence to see the art in the Uffizi and David at the Accademia. We had the same plans but we made the mistake (or we were smart??) and didn’t reserve ahead. That didn’t stop us though. With a little bit of creative timing we still got to see both. Since we were driving we started out day by visiting Piazelle Michelangelo. If you are looking for a stunning view of the city this is the perfect spot. We arrived around noon on a beautiful clear day however it is a great spot to enjoy the city around sunset. Whether you make it your first stop or your last stop I would definitely try to make it a point to check out this vantage point of the city. Tip: To save a bit of money we opted to use the Rick Steve’s App which has free downloadable walking tours for many European Cities including city walks and museums. We have used this app in Paris, and Rome to just to name a few. Our day was inspired by Rick Steve’s Renaissance walk however there are a number of walks in book. I would definitely recommend you pick up any of Rick Steve’s guides when traveling to Europe. Click here to shop on Amazon. With our favorite guide in our pocket we started our day. One of the first things you see from Piazelle Micheangelo (or any view of the Florence skyline) is the Duomo so it makes sense to start your day here. This is the city center which makes it a great starting point to explore all the Florence has to offer. Depending on time you have a few options here. While you can enter the Cathedral for free we opted to skip the long lines and admire this beautiful structure from outdoors. I would recommend taking a slow walk around the Duomo, Baptistery and Campanile. Rick Steve’s has a great tour that will talk about the history, the architecture and the art that can be found on the cathedral’s facade, doors and the dome itself. If you are interested in visiting the Baptistery, Campanile and dome you can purchase a combo ticket for €15 euro. However if you are interested in climbing the dome you must make advance reservations. It may be possible to make same day reservations. If you really feel that you must climb the Duomo then you should reserve your spot in advance to avoid disappointment. If you are unable to make reservations to climb the dome then I would highly recommend climbing the bell tower otherwise known as the Campanile or Giotto’s Tower. This is included in the combo ticket and doesn’t require advance reservations. Lines are usually shorter and you get a view of the Duomo which I personally think makes it the better option. We opted to skip the climbs since we didn’t make advance reservations and were short on time. If you have the time I would recommend at least considering the Campanile. After exploring the exterior of the Duomo, Campanile and Bapistery we made our way down Via de’ Calzaiuoli towards the river. This street is lined with shops, restaurants and all the gelato you can ever want. If you are starting to get hungry head down to the Ponte Vecchio. If you still have some steam in your then there are a few stops along the way that we chose to explore on our way to Ponte Vecchio. Piazza’s or large squares can be found at every turn in Florence. And if you are on a budget it is a great place to enjoy the architecture and art without paying the entrance fees to the museums. This is a great place to just take a bit of a break and admire the beauty of the architecture around. When we went there was a carousel in the middle of the square. Whether you are there with kids or not I say buy a ticket and jump on the carousel. It is magical. You will not be disappointed. 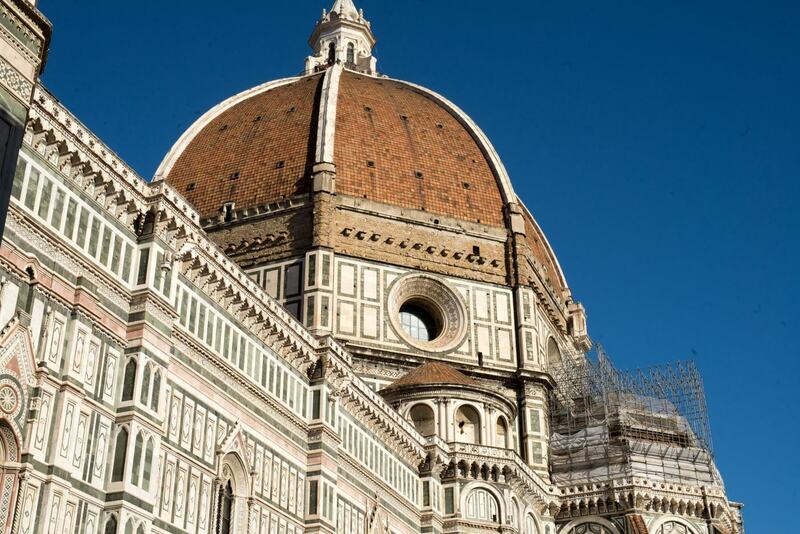 Home to the Palazzo Vecchio and the political center of Florence, this is a must stop. If anything stop here to see the “fake” David. This was actually the spot where the original David stood up until 1873. It was moved indoors to protect it from damage. After taking in all there is to see around you make your way to the Palazzo Vecchio. Step inside the courtyard and take a moment to enjoy even more art. This is a great spot to wander a bit and enjoy the art and architecture for free. Still standing in the Piazza della Signoria you will notice an open air museum with sculptures that is free for you to visit and explore. One of the most famous sculptures locates here is the statue of Perseo holding Medusa’s head by Cellini. This is just one of the many amazing sculptures you should take a moment to admire. 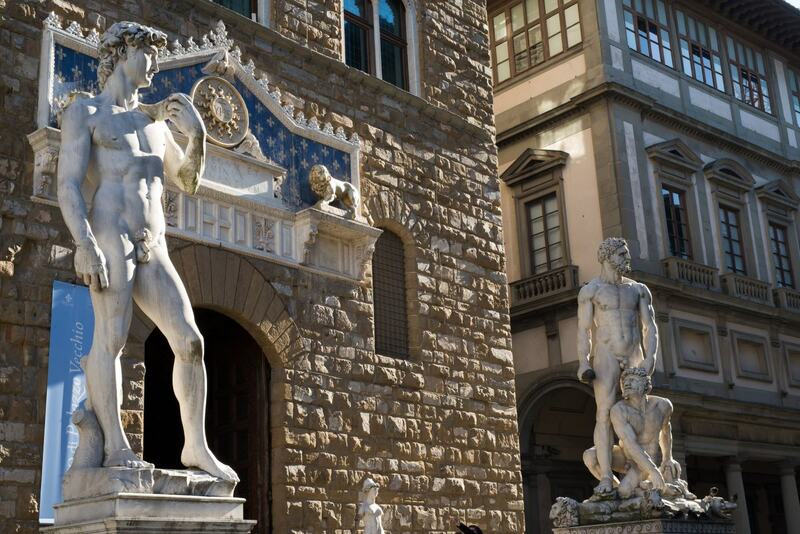 As you make your way towards the river take a moment to admire the statues that line the courtyard of the Uffizi. You will be coming back here later to visit the Uffizi however this is another free opportunity to enjoy the art. Translating to Old Bridge where the bridge stands today was a key part of the North South Trade route which ran through Florence. The original bridge washed away in a flood and the one that stands today was built in 1345. As you walk over the bridge take a moment to admire the views and of course take a few photos and selfies. As you walk over the bridge you will come across a lot of vendors and shops. These were originally inhabited by butcher, hide-tanners followed by gold and silversmiths. 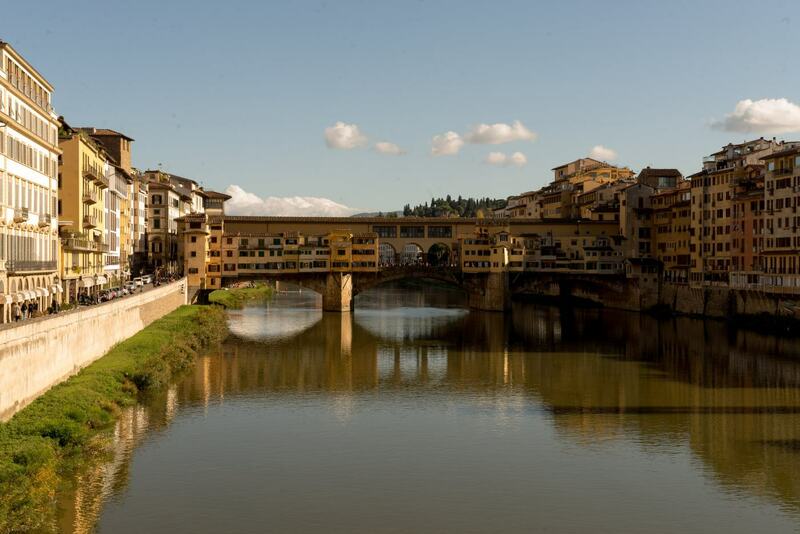 The Ponte Vecchio offers some of the best views of the city. Definitely take your time walking over the bridge and taking everything. Are you hungry yet? If you are you can keep moving because we will be coming back to the bridge. If you are hungry it is time to get some Pizza. Gusto Pizza came recommended so of course we had to visit for pizza. Pizza pies range in price from €6-€8. Depending on your appetite you can share a pizza or opt for your own. We also got a bottle of house wine for €10. It was a great way to take a break, have lunch and stay on budget. Make your way back to Ponte Vecchio however if you still have room stop at Gino’s Bakery for a Cannoli. While Cannoli’s are originally from Sicily they make a really good cannoli. Indulge. Why not? You’re on vacation. Now you are full and happy. So let’s hit up the museums. There are 72 museums in Florence. However there are two that top the list for must visit museums in Florence. Regardless of whether you are an art lover, the Uffizi Gallery and Accaddemia Gallery are must visits for anyone visiting Florence. Because of their popularity it can get really busy so advance reservations are highly recommended. You have a few options when planning your visit to the Uffizi Gallery and the Accaddemia Gallery. You can make advance reservations here or chance it and try to walk right in. If you try to walk right in chances are that you will be waiting on a very long line. Especially during the summer months or early in the day. If you happen to be in Florence for more than a few days you can also consider the Firenze pass. However I would only recommend this for visitors that are planning a much longer visit. If you are lucky you can try for same day reservations however just like anything else if you have your heart set on visiting then it is probably best to make reservations in advance. We did not make reservations. We like to live on the edge. However given the time of year we were able to walk right into to both by arriving later. Peak season is April-October therefore if you are visiting during the off peak season you may get lucky as well. I would recommend going later in the day if you opt to not make reservations. We started with Accaddemia. We arrived at around 3:30pm and walked right in. The great thing about arriving later in the day is not only did we avoid the long lines and waits but the crowds were minimal. We were able to enjoy David just with a handful of others as opposed to trying to climb over crowds to get that perfect shot. Everyone comes to the Accaddemia to see David. And you will not be disappointed. However the Accaddemia is also home to other Michelangelo sculptures as well as plaster models for some of the sculptures that now stand in the Loggia dei Lanza. We really were only interested in seeing David so we spent less than an hour at the Accaddemia. We saved the best for last. One of the most visited museums, make sure to set aside time to visit the Uffizi Gallery. We arrived at 5pm. The museum closes at 6:45pm and the last entry is at 6:00pm therefore we had plenty of time to explore. Rick Steves (Are you tired of hearing about him yet), has a great guided tour on his app. So we opted to use that as our guide around the museum. The tour starts on the top floor of the Uffizi in Room 2. You will start in Medieval times and make you way through the Renaissance. As you wander through the rooms take a moment to really take in the art. It is quite amazing. Eventually you will make you way back down to the ground level. There is also a cafe where you can take a break midway through. They have an outdoor area where you can enjoy the view as well. Since we were there later in the day we only stepped out for a moment. Depending on your budget there are so many great restaurants in Florence it is almost impossible to choose a favorite. Below is a list of some restaurants that have come recommended that have been sorted by price point. If you are looking to splurge this place comes highly recommended. It is probably one of the more popular restaurants so be sure to call ahead. Not as pricey as La Giostra but still another splurge. People come here for the Florentine Steak. Great pastas and wine list. Very moderately priced. Local restaurant however is very popular so reservations are recommended. After the museums we decided to stop in for some wine before dinner. We just wandered a bit until we found a spot we liked. Whether you choose to get a cocktail or a glass of wine before or after dinner there are plenty of places to do so in Florence. This is far different than a lot of the other towns which are usually asleep by 8pm. There is some nightlife to be had. 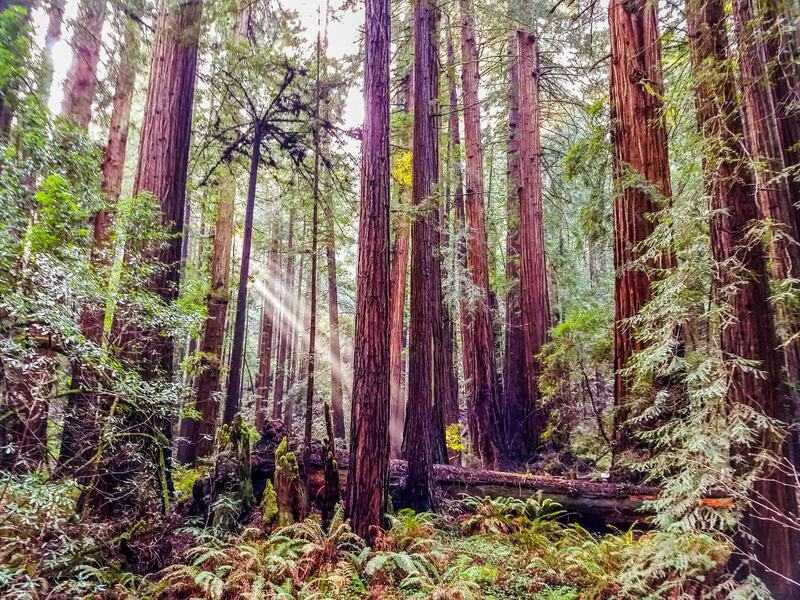 Wander around until you find a spot that is your vibe. They have a combo of clubs, wine bars and coffee shops. So there is definitely something for everyone. 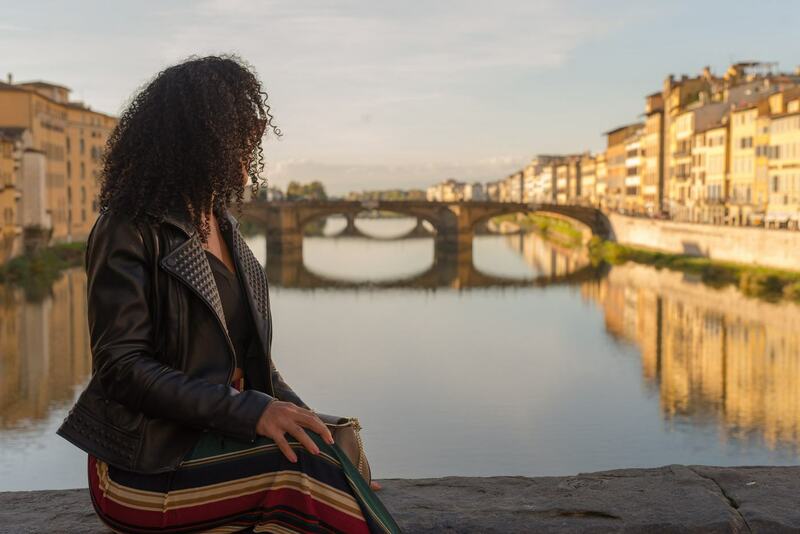 Whether you are here on a layover or for a few days it is easy to get lost in everything that Florence has to offer. However rest assured that even if you are in Florence for a few short hours you can still see and do plenty with a little bit of planning. Have I convinced you to visit Florence yet? Planning a trip to Florence. Don’t forget to pin this guide. So glad you had such a great time! We ate at Antica Trattoria da Tito and it was so delicious! I completely agree about the Campanile. It’s well worth the climb and avoids the crazy lines of the Duomo. Great post! Florence was amazing. By far makes the top of the list. I will have to add that to my list for next time. Because there will definitely be a next time. So happy to hear you found the information helpful. Florence is amazing. I cannot wait to visit again soon.